I know some of my readers have taken or thought about taking David Goldberg's Garden Photography Class at UC Berkeley Extension. You'll be glad to know that he is planning a class for spring 2011. A long way off, but you know how these things go. It will be a field/classroom alternation--a class in a garden that he will select, then a classroom session to review the images. (His photography career has given him access to many fine gardens.) If you have taken his previous classes, this one will be an enrichment and provide more experience. If you haven't, you can get started with this one. It can be taken with a film or digital SLR camera that has manual settings. The class will cover the skills needed to create great closeups as well as strong images of larger garden areas. You can see examples of his photographs on his website at www.davidgoldbergphotography.com or ask him questions about the class at david@davidgoldbergphotography.com. I am back from Southern CA once again and will have some photos to share of subtropical and tropical fruit, but wanted to be sure to include a couple more Bay Area spring bloom shots and mention David Goldberg's photography class one more time. This tree is an ornamental plum. The double blossoms are so voluptuous against the otherwise bare limbs of the tree. And this one is a tree peony. I wrote about these in my SF Chronicle column (at SFGate.com) a couple of weeks ago, but didn't have a photo then. This one is blooming in the Asian plant section of the SF Botanical Garden in Golden Gate Park. These plants, which are really shrubs that grow to about 4 feet tall, have the same lovely flowers as the herbaceous peony of colder climates, but can thrive in S.F. and other places that have very mild winters. 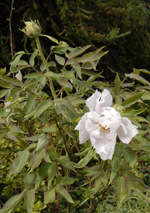 This one is a single blossom, but there are also double-flowered varieties. There are even yellow and orange tree peonies. I notice that a number of viewers of this blog have been linking from my blog to the blog about the Garden Photography Class that starts next Saturday. One last plug before it begins. It isn't taught often, so if you think you will want to know how to take better plant or garden photos, this is the moment to jump. Maybe you still love to shoot film, or maybe you have purchased a good digital camera, or are thinking about going digital. Maybe you have been shooting a bit and wondering how to get better at it. This class will get you into the nitty-gritty of using your camera better and with more confidence, and will get you into gardens that will inspire you to want to shoot more photos. Check it out at www.gardenphotographyclass.typepad,com. There are links there to see photographs by the instructor or to enroll through UC Extension. A few words about David Goldberg's upcoming class on Garden Photography, which is being offered through UC Berkeley Extension. It starts on Saturday, March 29th. It will be held at the Extension's downtown SF campus, with validated parking next door. It includes 3 field trips to Bay Area gardens, where you can practice the skills you are learning in the classroom. And, most importantly, David is an excellent teacher, who will put energy into helping you improve your photography. The photos in this entry are David's. You can many more of his shots on his web site: www.davidgoldbergphotography.com. You can learn many more details about the class on his typepad blog page: www.gardenphotographyclass.typepad.com. Whether you want to improve your plant and garden shots for personal reasons, or need better shots in order to market your work as a garden professional, this is the class that can get you from here to there. It isn't offered very often, so I encourage you to get it while it is available. Time to announce that David Goldberg, the professional Landscape and Garden Photographer, who took the photos in my book Wildly Successful Plants: Northern California, will be teaching this spring at UC Berkeley Extension. The class is called Horticultural Photography, and will take place at the SF campus, Saturdays, starting March 29th. David is not only an excellent photographer, but also a clear and helpful teacher who will help you make a quantum leap into taking better photographs with your digital or film SLR. You may want to do that just for enjoyment, but if you are planning or already in a landscape career, you will want to know how to take the best possible shots to use for marketing or to enter competitions. To learn more about the class, check out www.gardenphotographyclass.typepad.com. You can also see lots of David's photographs on his website at www.davidgoldbergphotography.com, and can send him any questions you may have about the class.